Fifteen years down the line and Blu Mar Ten continue to release some top D&B. Having set up their own BMTM label back in 2009 for their homegrown creations, the doors have opened to invite inside similarly minded souls to lay down their own take on the more leftfield leanings of beats and bass. The first release in this new chapter comes courtesy of long-time friend and collaborator Stray. Following a run of hits on Hospital Records, Critical Records, Med School, Exit, Noisia's Invisible Records and Giles Peterson's Brownswood, Stray has delivered a single that perfectly sets the BMTM tone. 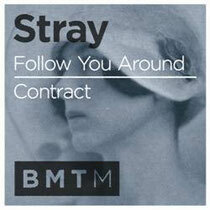 Brimming with melancholy and unrequited love, with ‘Follow You Around’, Stray has created a lesson in how to deliver emotional D&B. An 808 drum track carries lamenting vocals and ‘80s keyboards while a groaning analogue bass underpins the whole affair. Stray then steps up a few gears with ‘Contract’ as he charges headlong into straight-up cyberfunk. With its twisted bass tones and reptilian percussion, ‘Contract’ is punctuated with sinister silences as off-kilter synths add to the tension.